I'm going to sing the praises of an amazing product that I wish I had discovered much earlier than I actually did: Anki. Anki is a flashcard app available on mobile, desktop, and web - and it's brilliant. (And no, I'm not getting paid to say that!) Best of all, it is both free and open source. What's really unique about Anki is that it calculates when you need to see a card again before you forget it. Unlike traditional flashcards (or even flashcard apps like Quizlet), where you just go through an entire set over and over again, Anki efficiently shows you only the cards it estimates you need to see before you forget them. You don't waste time looking at flashcards you know really well, and the rest are shown to you based on how familiar you are with them. How does Anki know when you need to see a card? It uses an algorithm, which you can customize (though I never did and I've been successfully using the default for years). You can create your own categorized flashcard decks within Anki or download decks that have been created by others. I find a mix of both to be useful. For example, I use Anki for foreign languages, but I have my own running vocabulary deck on top of ones others created based on standard textbooks. I also use Anki for things like U.S. military insignia as well as world geography. It supports audio and images on your flashcards, too. You can decide how many new cards you want per day, which I've changed from time to time depending on how busy I am. Because I currently have a lot of flashcard decks and not much time, I only look at one new card per deck per day. I keep Anki synced across my smartphone (the app for Android is called AnkiDroid) and desktop. This is helpful when I come across Arabic vocabulary in a news article, for instance, and I add it to Anki via my desktop but see it when going through my flashcards on my phone later. As a final note, "AnkiApp" is not the same thing as Anki. They are two totally separate products, and my recommendation only extends to Anki. Ready? I Was Sworn Ready! The 190th A-100 has been formally sworn in, making us pretty official. My feelings are bittersweet, which I didn't expect despite the warnings of those who came before me. The six weeks of orientation flew by, and yet I feel like I've known everyone I met here for so much longer. (Also, if I'm honest, I'm not sure I could handle one more orientation training.) 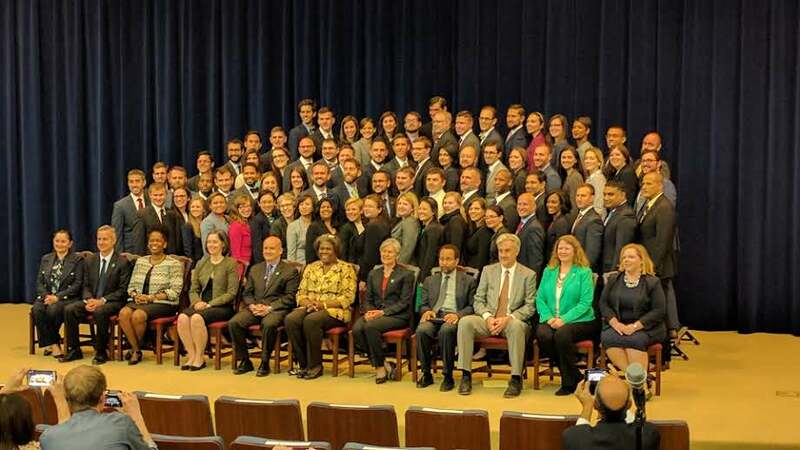 What I'll miss most are definitely the people: my A-100 colleagues and the coordinators and staff and mentors and everyone else who made our introduction into the Foreign Service possible. Although it's hard to think about how we will never be together as a complete group again, I look forward to crossing paths with many of them many times, whether in the hallways during training or overseas. I know I've made friends for life. It goes by fast. Live in the moment. Fight imposter syndrome. Everyone there deserves to be there. Don't be afraid to attend a class roast. "I, (name), do solemnly swear (or affirm) that I will support and defend the Constitution of the United States against all enemies, foreign and domestic, that I will bear true faith and allegiance to the same, that I take this obligation freely, without any mental reservation or purpose of evasion, and I will well and faithfully discharge the duties of the office on which I am about to enter. So help me God." I'm deeply honored to represent this great country alongside men and women as amazing as those whom I've come to know and love over only six weeks. It's up to us never to forget whom we serve. WE'RE GOING TO NAIROBI, KENYA! Let's rewind a bit. We just had Flag Day, which is like a Foreign Service graduation except it happens before you're done with orientation training (A-100). It's very reality TV-esque, with officials announcing all of your posts in random order in front of your colleagues, family, and friends. When your name is called, you go up to the front to pick up your flag and get your training packet that says how much longer you have before you move abroad. It's exciting and nerve-wracking for literally everyone. 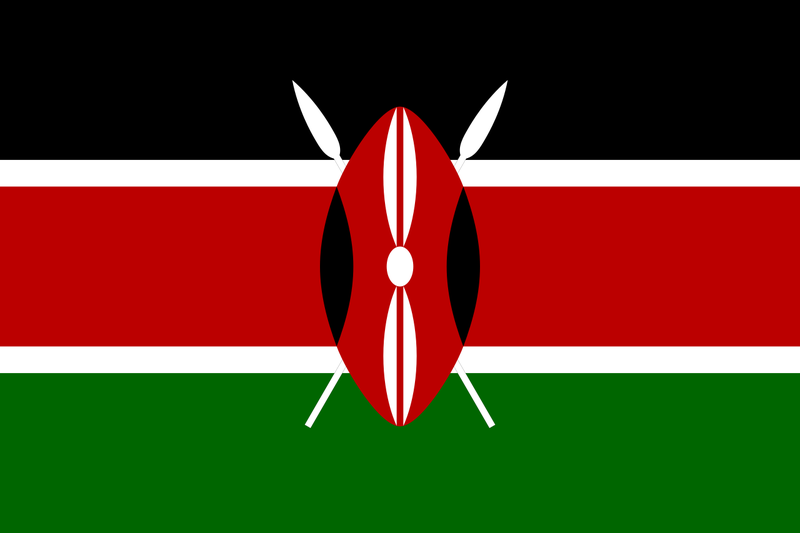 I was called in about the middle of the pack, but I was shocked to get a Public Diplomacy (PD) job in Nairobi. I have no experience in Africa. I'm excited to stretch my abilities and try something new. There's a reason they call Foreign Service Officers "Generalists," after all! The job itself is amazing. There aren't a ton of PD Officers (like myself) in my A-100, but there were even fewer PD jobs. We were told early on that we cannot expect to gain experience in our preferred career track right away because there's simply a scarcity of available PD positions. I am one of the lucky few who get to have that PD experience right off the bat. The weather is perfection. When I read reviews of life in Nairobi, my heart soared at "Don't bother bringing winter clothes." The temperature generally ranges from 50-77°F (10-25°C). This is a big deal for me! I will have experiences I can't have anywhere else. Safari, anyone? I've heard great things. I've heard morale in Nairobi is very high, and there's a tight-knit expat community spanning a range of governments, international organizations, and nonprofits. The Internet is good. This was a big factor for us, because M needs to be able to telework. Our lease expires right on time. In all seriousness, I was a local hire, so I'm ready to shake things up and get out there as soon as possible. Also, our lease is going to end when we need to leave, which is extremely convenient. We can't wait for the next adventure! History and Records and Secrets, Oh My! The U.S. is astoundingly open about many things. We're one of the few countries in the world that declassify covert operations, for example. It's in light of these facts that I find far-reaching conspiracies about the U.S. government even more hard to entertain than run-of-the-mill conspiracy theories. Not only would a massive number of people be required to keep most suggested conspiracy secrets, but clearly any attempts to silence the conspiratorial masses have utterly failed (considering proponents of documentaries, blogs, entire publications, and communities persist in openly discussing and sharing their anti-U.S. government views instead of languishing in prison or simply "disappearing" as they would in a truly repressive state). A great place to start if you want to read for yourself is the National Security Archive, housed at George Washington University. It's a gold mine, and it seems that new documents are becoming declassified and shared online almost every week. One of my favorite documents to share is the CIA white paper from 2002 about suspected Weapons of Mass Destruction (WMDs) in Iraq, which was relied upon in justifying the Iraq War. You can read it in full here. It can help us understand why the U.S. government decided to intervene in Iraq and why the American people supported it so strongly at the time. The National Archives also preserve extremely valuable records for the benefit of present and future generations. Even if you can't visit them in Washington, DC, you can enjoy the many resources they've provided online. One of my favorite ones to share from not-so-distant history is President George W. Bush's remarks at the Islamic Center in DC mere days after 9/11. President Bush, in this particular instance, exhibited wonderful statesmanship by declaring that Islam is peace and that terrorists are not true Muslims. He went on to condemn those Americans who would take out their anger on innocent Muslim people. The whole thing is quite short and very beautiful, and I highly recommend reading it here. With the aid of original sources like these, we can debunk myths. We can challenge our assumptions. We can more fully understand decisions that changed the course of history. Therefore, we owe it to our posterity to preserve these records to the best of our ability.